Hand-selected by the expert growers at Costa Farms, the O2 for you collection is the most efficient, natural air-purifying plants around. These plants are scientifically Proven by NASA to be some of the very best plants for clean air. The clean air plant collection is perfect for decorating Desks, tabletops & other areas. 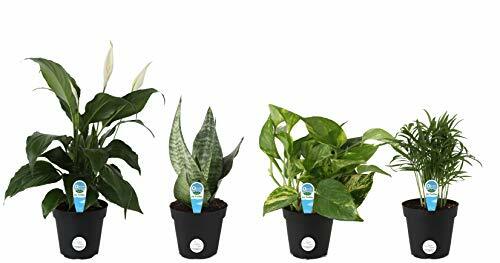 Our collection includes peace lily (spathiphyllum), snake plant (sansevieria), Parlor palm (neanthebella palm) & devil's ivy (golden pothos). each are considered some of easiest house plants to grow, requiring water when soil is dry. Remember to drain any excess water & place in a room with medium light. Plants are living things; each one is slightly different, so the plant you receive may vary from the photo. Our growers hand pick the healthiest, best-looking, highest-quality plants. We package our plants for shipment with great care so they’ll arrive at your home ready to be displayed. We're unable to ship this item to: AK, AZ, CA, GU, HI. Our plants come in pots for all decorating needs: shelf size (7-14in tall), tabletop (16-24in), & Floor (24-48in). Look for Costa Farms when buying plants online. Be aware of third-party sellers; other companies try to imitate our quality. On Amazon, there are no other authorized Costa Farms sellers. Look for “ships from & sold by ” to ensure you’re getting our premium plants. Shipped fresh from our farm to you, Costa Farms is passionate about delivering happy, healthy, beautiful plants. Ancient Bristlecone Pine Tree Growing Kit - Pinus Aristata - Grow Evergreen Pines from Seed To Saplings - Kit Includes Seeds, Instructions, More.